If you want to lose weight fast, the 6 Week Body Makeover Diet is one option that aims to peel off pounds and sculpt the body within six weeks. The diet and exercise plan was created by Michael Thurmond, fitness expert from the television show "Extreme Makeover." The program includes a questionnaire to identify your metabolism type and categorize it as A, B, C or D, and offers a meal plan, based on your category. According to the Michael Thurmond plan, body type A has the slowest metabolism, and people with this body type have likely struggled with excess weight for a lifetime. 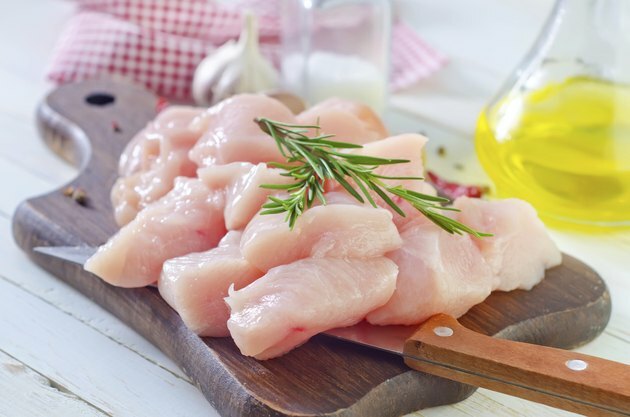 The 6 Week Body Makeover plan recommends that people with body type A incorporate lean meats, such as chicken, turkey, halibut and cod into their meal plans. Type A dieters should avoid carbohydrates, such as fruits, starchy vegetables, processed grains and pasta, warns the plan. A sample type A meal includes roasted new potatoes, spring vegetables and grilled halibut. The body type B dieters in the program are characterized by being able to build lean muscle. Body type Bs still have a slowed metabolism and should avoid complex carbs, such as potatoes, yams, rice and unrefined pastas, according to the plan. Recommended foods for body type B include chicken, turkey, tuna, shrimp, crab, brown rice, berries, grapefruit and egg whites. A sample menu for type B includes egg whites and grapefruit for breakfast, turkey breast and lettuce for a snack and chicken breast, brown rice and mixed vegetables for lunch and dinner. Body type C is similar to body type B, according to the program, but body type C has a faster metabolism. As with body type B, body type C builds lean muscle easily. The body type C meal plan includes more carbohydrates than the body type A or B plans. A sample type C meal includes chicken and shrimp, stir fried with mixed vegetables. Thurmond's plan characterizes body type D by a slow metabolism and lack of significant muscle mass. The body type D diet includes red meats for protein. Body type D people should stay away from simple carbs found in foods, such as fruits and processed grains, according to the plan. A sample body type D menu includes egg whites, oatmeal, lean steak, fruit, chicken breast, rice and mixed vegetables. Consult your doctor or a nutritionist for approval before beginning a 6 Week Body Makeover Diet. The plan includes an exercise program that can help burn calories and boost your metabolism, so stick to the workout schedule. The program aims for dieters to lose 30 lbs. within six weeks, but individual results may vary. Restrictive dieting can cause a loss of water weight, which is often gained back. Restrictive diets may also lead to weight gain, once you return to your regular diet and your calories increase.